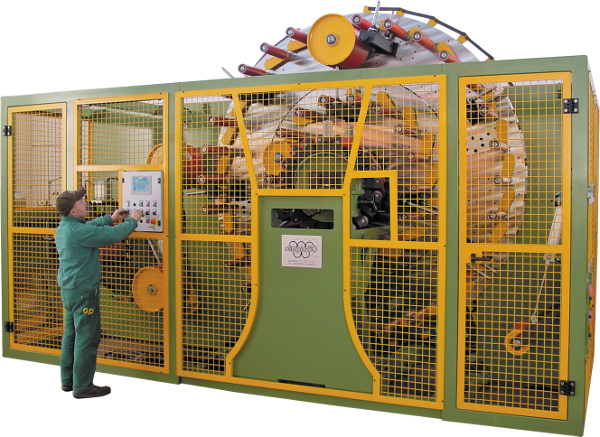 Olimpia 80 supplies equipment for the mill entry section suitable for any kind of strip width and tickness and for any production speed. 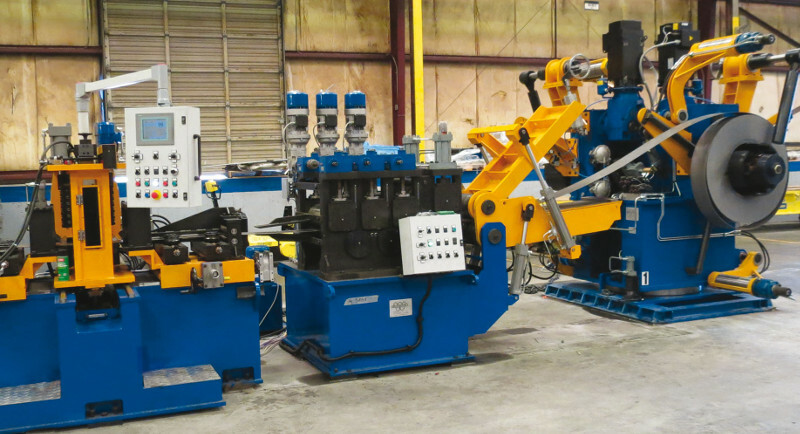 STRIP FLATTENING UNIT complete with hydraulically operated coil opener. 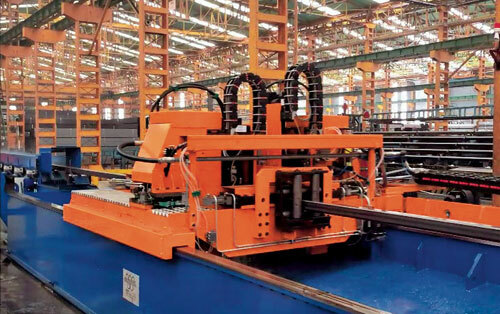 STRIP END-JOINER complete with hydraulic shear, strip hydraulic blocking system, semi-automatic Tig welding unit, pinch roll for strip feeding. 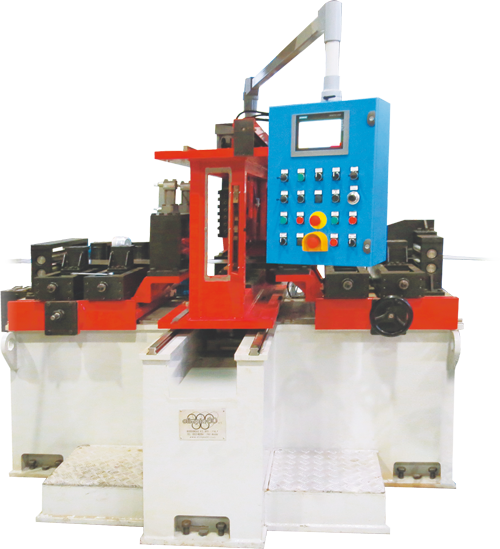 These devices have been designed and manufactured in order to meet the quality requirements of the lines with LASER welding system and in any case to ensure optimum quality of the strip edges if it was specifically required also in other applications. 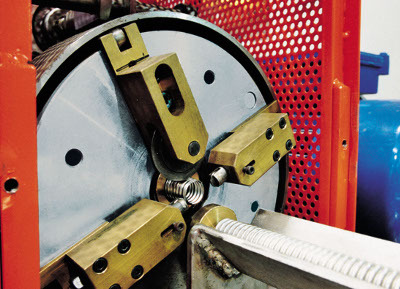 These equipment allow to eliminate totally the line stops due to coil change. Olimpia offers a wide range of models which are able to meet different production needs and are suitable for variuos type of material. 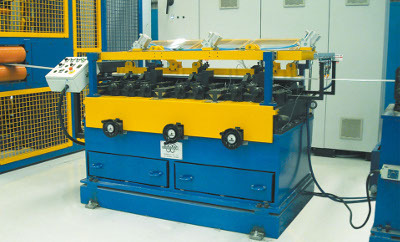 This strip accumulator is mainly indicate for production in continuous of tubes at low speeds. 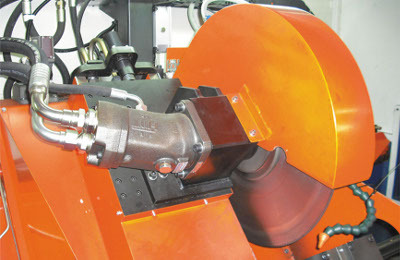 Particularly designed for Tig welding lines. 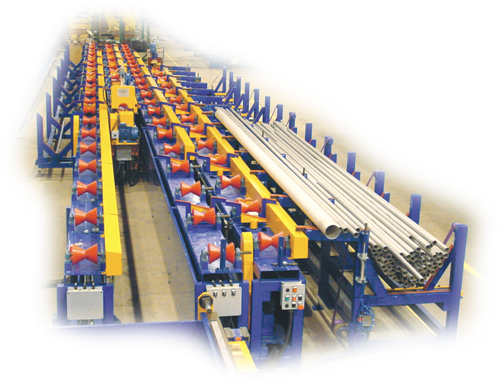 This accumulation system is designed for high speed production lines and consent to accumulate also strips with very high thickness. The maximum strip loading speed is 400 m/min. speeds. 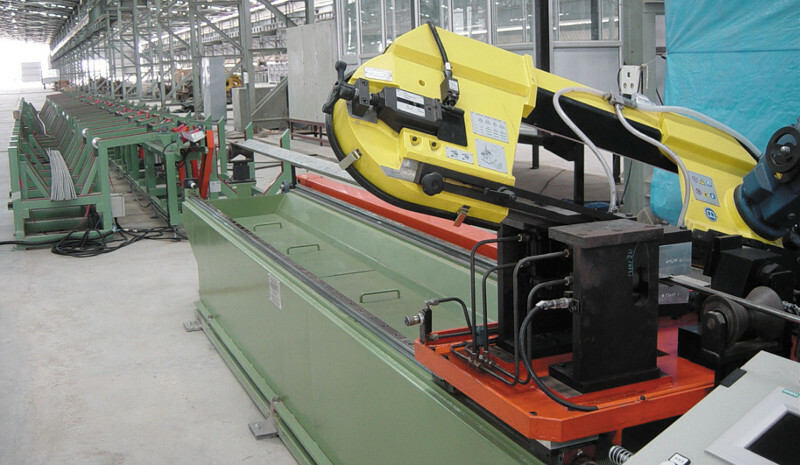 The equipment consent to load the strip at a maximum speed of 500 m/min and up to a limit weight of 80 tons. 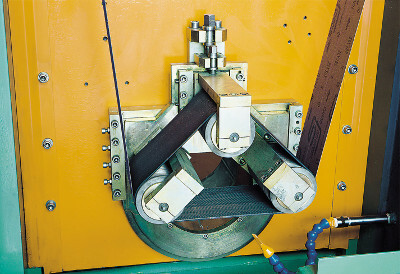 The strip tension is electronically controlled by a dancing roll which is placed at the entry of the line. 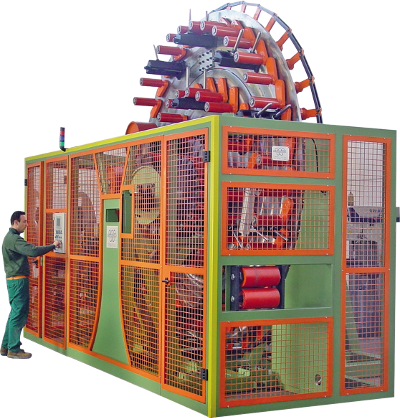 This new vertical strip accumulation unit has been specifically studied for its use on laser welded tube mills, with speed up to 30 m/min. 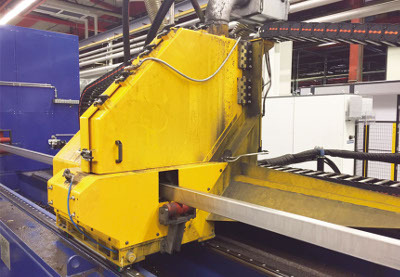 This is a new solution that allows a secure control of the strip at medium speeds, assuring the complete absence of yielding and damages to the material. 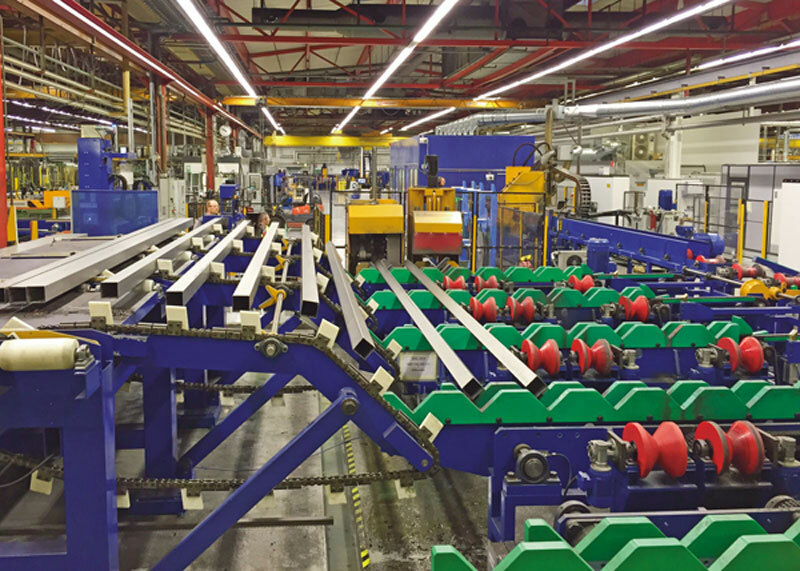 Strip accumulation system studied for high production speed tube mills. 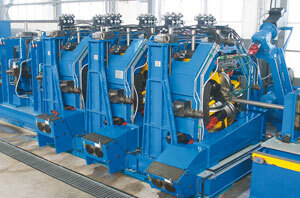 This equipment permits the strip accumulation at a maximum speed of 400 m/min. With a new patented system allowing a better finish and a 30% longer belt life. 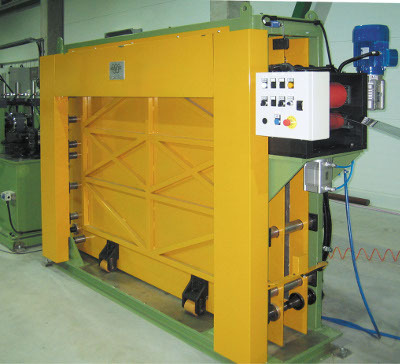 Abrasive belt dimensions: 3000 mm x 150 mm. For bead removal on small tubing and for weld oxide brushing on H.F. lines. 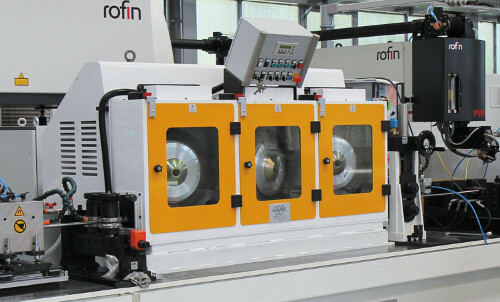 A considerable increase of the use of laser welding has solicited the development of a machine for external bead grinding, which is indicated for a different configuration of the laser welding seam and for the increased production speed. 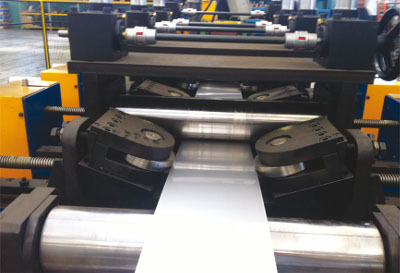 A new equipment has been engineered which, thanks to the use of special flap wheels, permits to eliminate the bead at high speeds without scratching the surface of the tube. The work is done in a completely dry condition, with considerable reduction of maintenance times and costs. Furthermore, the device for the automatic wearing compensation allows to obtain a completely homogeneous removal. This system makes use of two tools with hard metal tips. 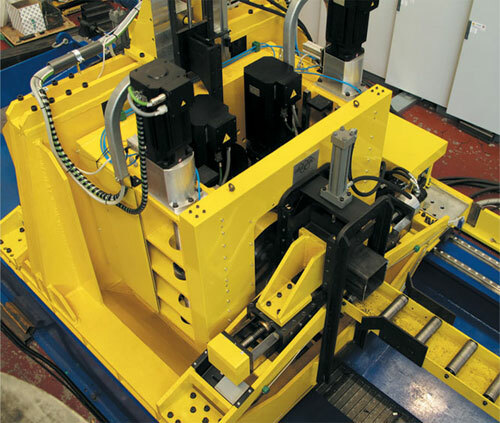 Tool adjustments are electronically controlled, such as the automatic positioning at the production start and the automatic tool wearing compensation. 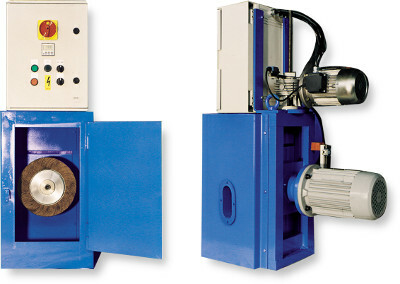 Olimpia 80 offers bead rolling machines for the inside removal of the weld bead that can guarantee an high finish quality and the greatest stability. This bead roller is suitable for Tig and Laser welded tubes, with inside diameter fron 14 mm to 220 mm. Tube speed: max. 10m/min. 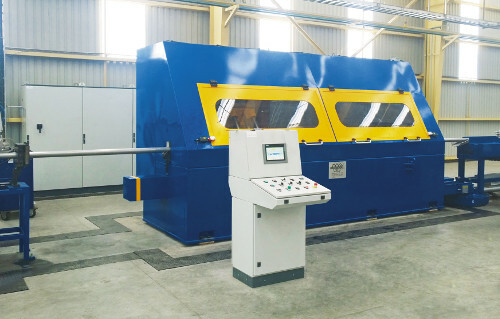 This equipment, specifically designed for laser welding Tube Mill, gives the advantage of no mechanical connections between mandrel and any external support: the wire rope moving the mandrel in the traditional hydraulic system can be totally eliminated. The internal mandrel works thanks to the magnetic field generated by a permanent magnet sliding on rails in an alternate rectilinear motion. 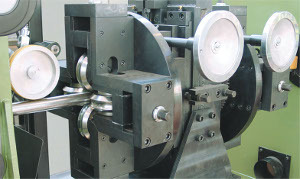 This permits also the consequent reduction of the minimum inside-rolling diameter. 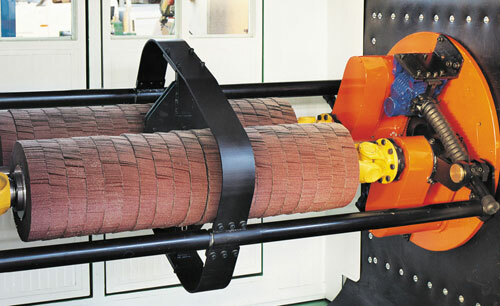 Revolutionary bead hammering system based on new concepts of high speed and stability (5000/6000 stroke/min). 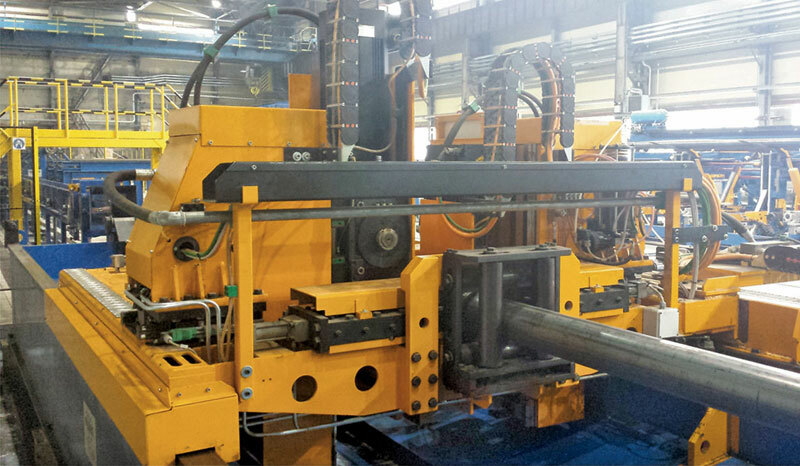 This new equipment has been studied for tubes from 14mm to 76 mm I.D., with a maximum wall thickness of 3.5 mm. 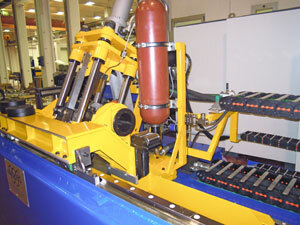 Tube speed: 6-7 m/min. 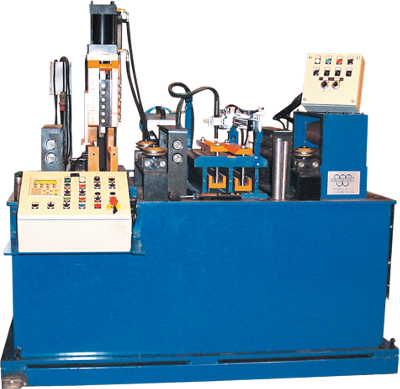 Adjustable rolls system, to prevent the tube twisting and for adjusting the position of the weld bead. For HF and LASER tube mill. 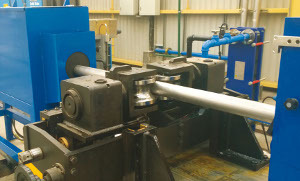 Single and double turk’s heads for in line tube straightening and for forming and finishing of section tubes. 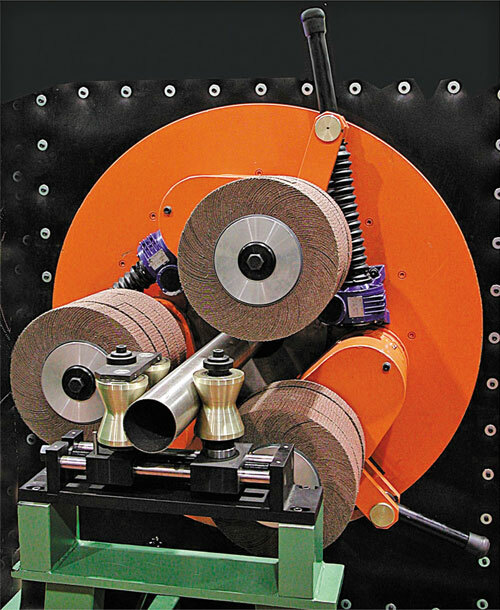 UNIVERSAL driven TURK’S HEADS, for shaping square and rectangular tubes without changing any single roll in the sizing turk’s head stands. 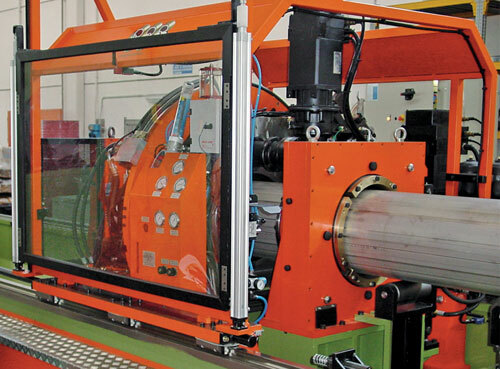 Olimpia 80 provides in line installations of non-destructive tube testing systems. 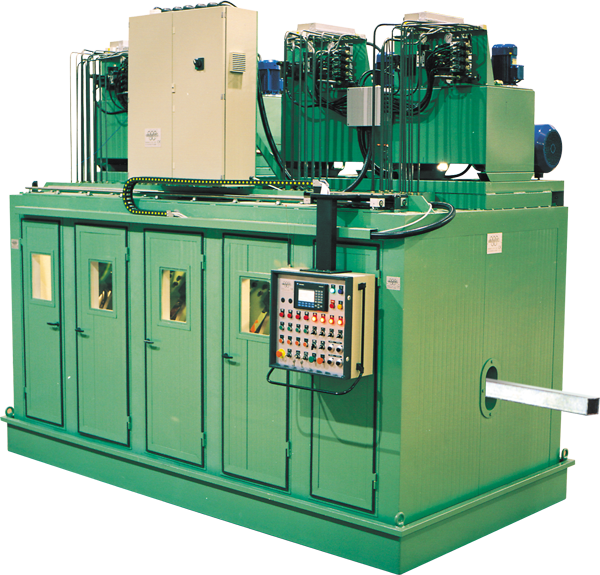 EDDY CURRENT unit for weld bead control or for tube full body control. In-line laser instrument for TUBE DIAMETER AND OVALITY MEASUREMENT. 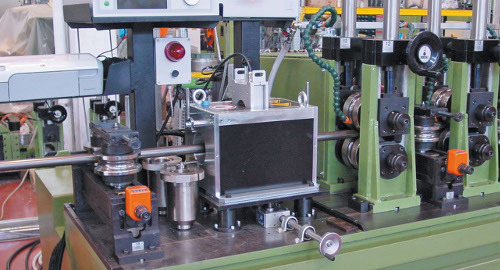 Automatic straightness adjustment by connection between tube position measurement system and turk's head drives. 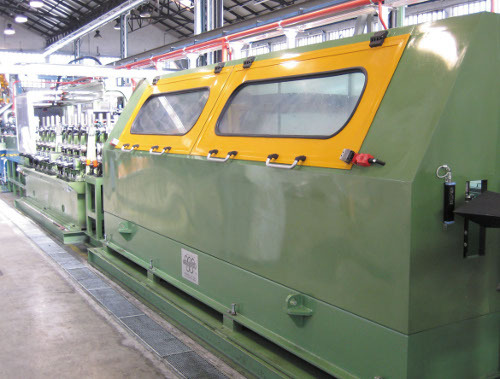 Olimpia 80 makes different types of in-line tube cutting machines studied for all kind of materials and production speeds. 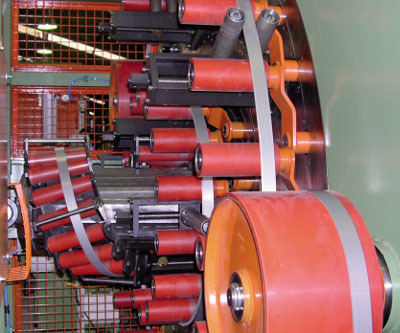 CUT OFF BY ROLLERS, used for thin wall tubes up to 35 mm O.D. CUT OFF WITH MECHANICAL DISK, suitable for tubes up to 88.9 mm O.D. 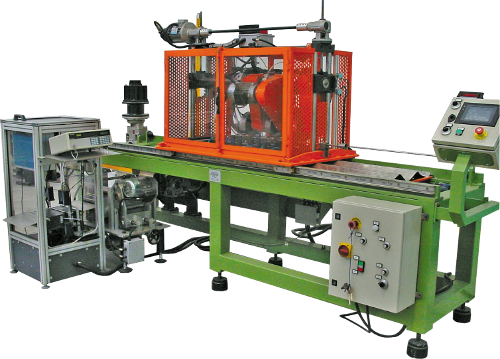 THREE-SAW CUTTING machine for small tubes, complete with automatic deburring unit. 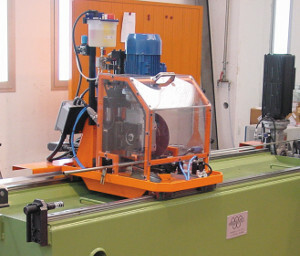 CUTTING MACHINE BY BAND SAW for tubes up to 114 mm O.D. COLD SAW CUT OFF with positioning of the cutting head at 45°. 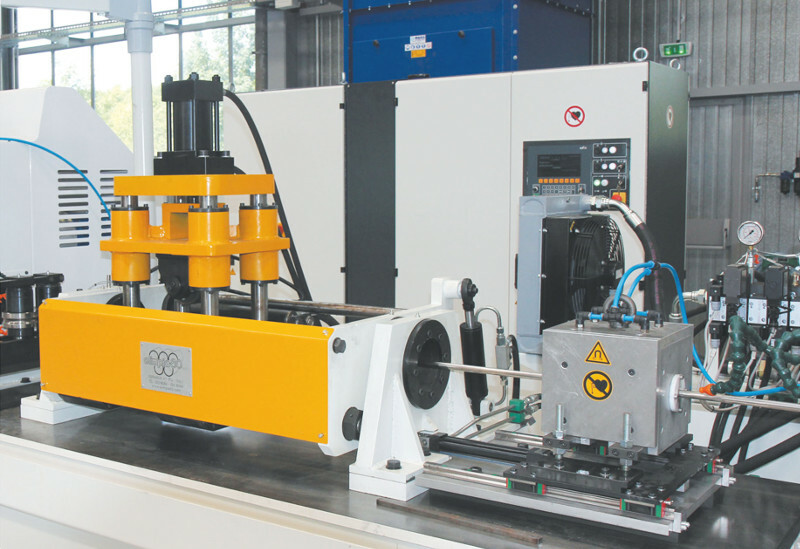 This equipment is especially suitable for Laser and Tig production lines and allows high precision and good tube end finishing. 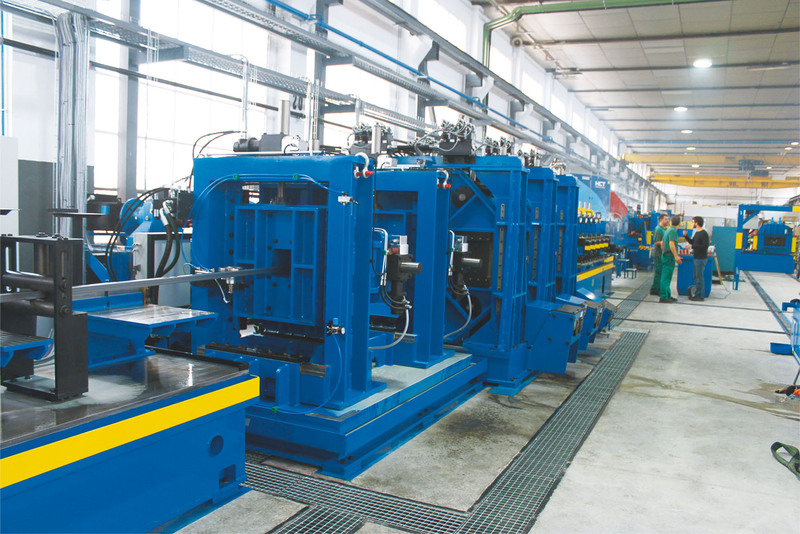 These cutting equipment are design for cutting tubes at high production speeds. 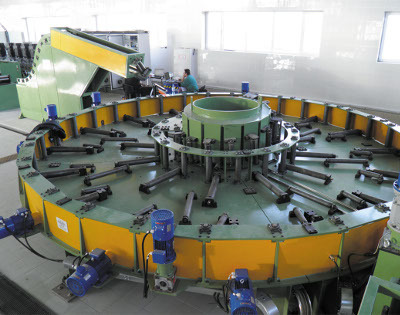 An automatic control system allows to optimize blade positioning according to the tube diameter and thickness, setting the speed of feeding and rotation of the blades. This system is able to optimize and increase the number of cuts. 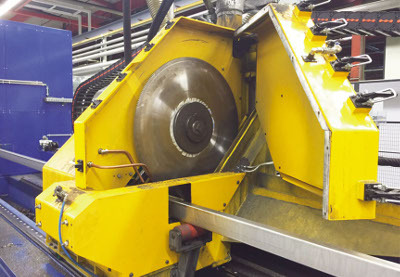 Disk saw flying cutting machine. 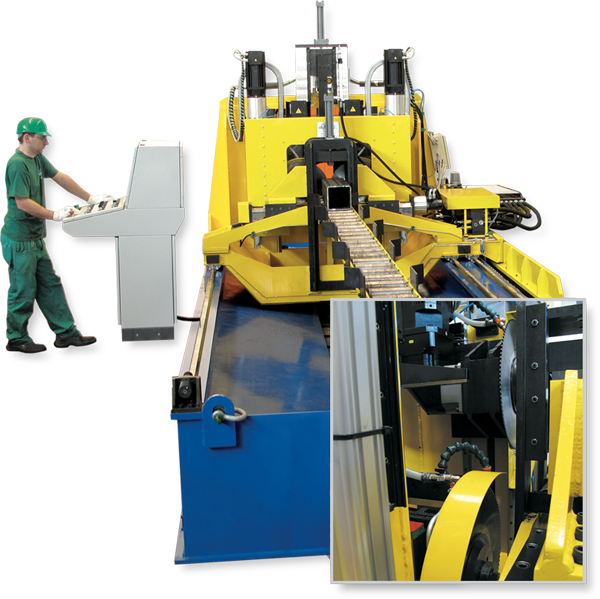 Tube cutting is operated by means of two tools which are hydraulically operated and controlled by the latest electronical technologies. 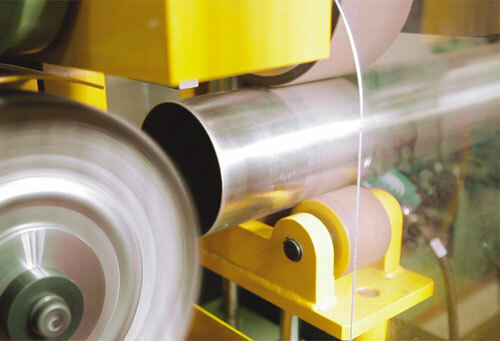 The whole process is controlled by one hydraulic cylinder which guarantees the perfect synchronization of the cutting cycle and to obtain optimum conditions on the cutting time. 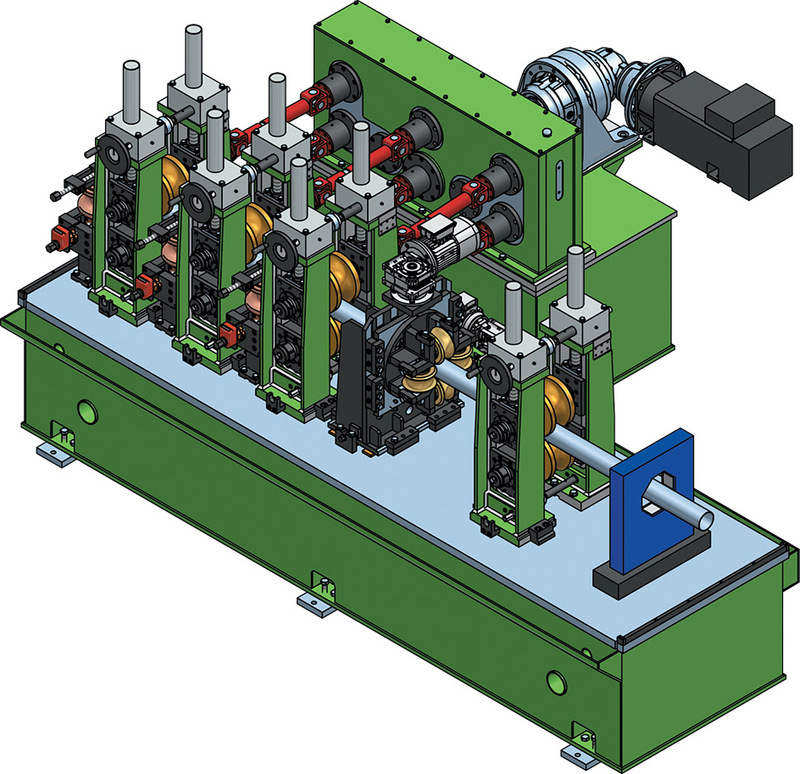 In addition the employ of hydraulic systems assures an easy use of the machine and a reduction of maintenance times and costs, compared to the use of mechanical systems. 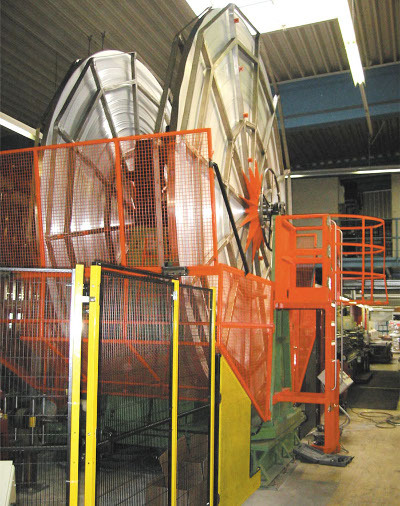 The movements of the cutting carriage are electronically controlled to guarantee the automatic adaptability to the tube speed. 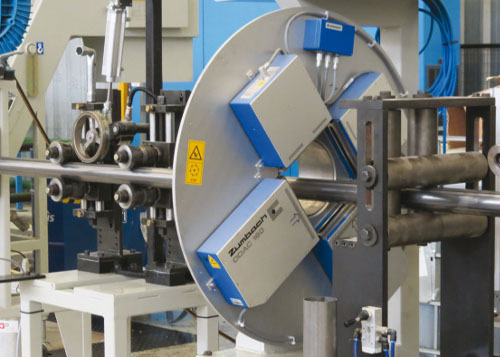 Moreover an inclination system allows the automatic tool centring on the tube angle in case of production of square and rectangular profiles. 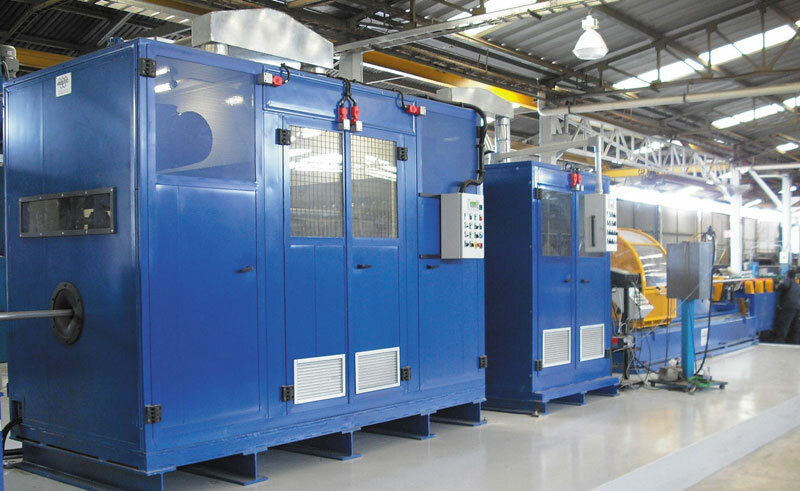 This equipment is offered in two different models covering ranges from 15 to 76 mm O.D. and from 30 to 114 mm O.D., with wall thicknesses from 0.8 mm to 3.5 mm. 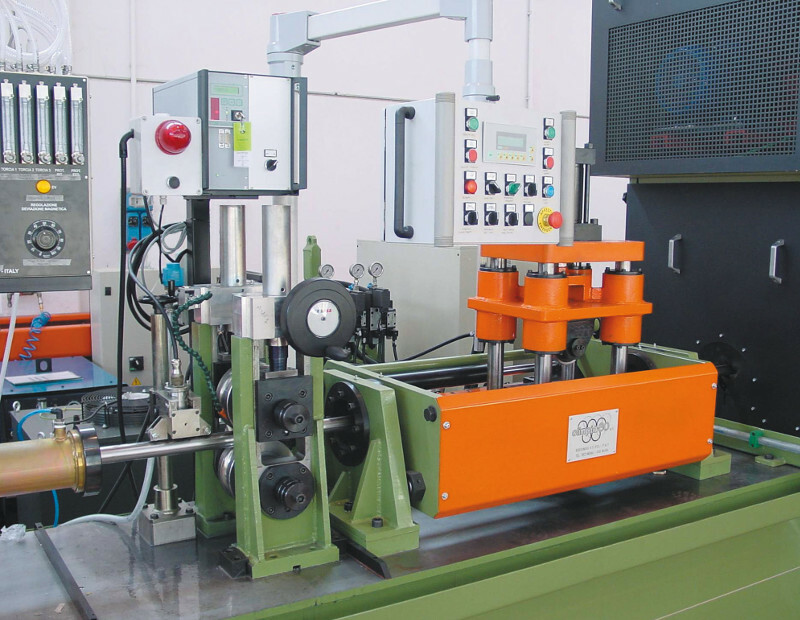 This new machine has been designed for the in-line cutting of large dimension tubes, in round, square and rectangular shapes. 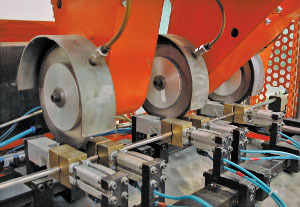 The innovative system with parallel movement of blades allows to reduce the cutting cycle time and to make easier the set up of the blades. Moreover, thanks to the new universal tube blocking system, the vices change is not necessary for square and rectangular profiles and this consents a great reduction in costs and time. 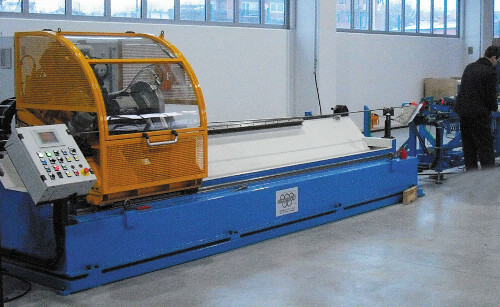 This cutting machine, especially designed for large pipes. 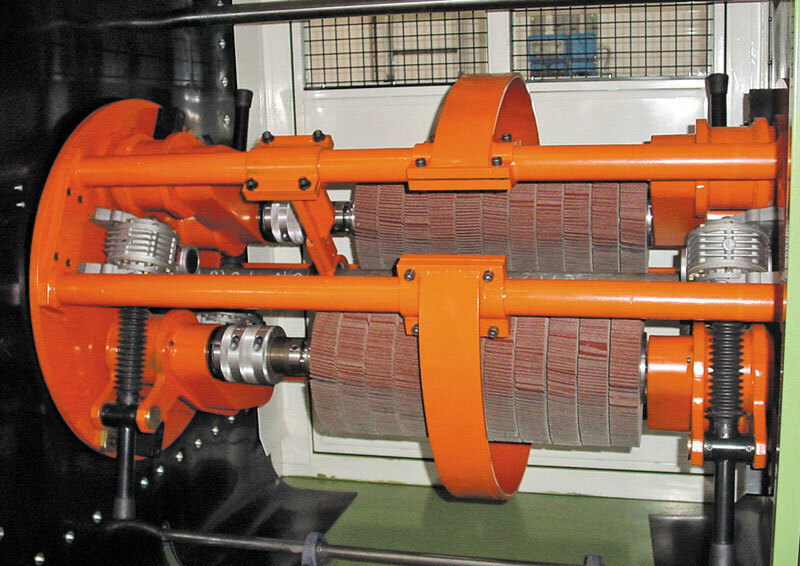 The machines works with 2 blades, mounted on slides and placed on a rotating support, penetrate into the tube with material removal and make the complete product cutting by means of the support rotation. 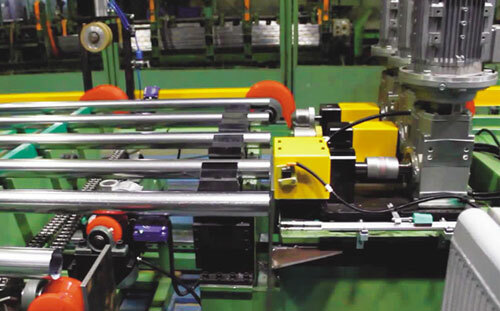 Tube is hydraulically clamped and the complete cutting group is mounted on a sliding carriage which is complete with electronic movement device that assure a cutting precision of +/- 1 mm. 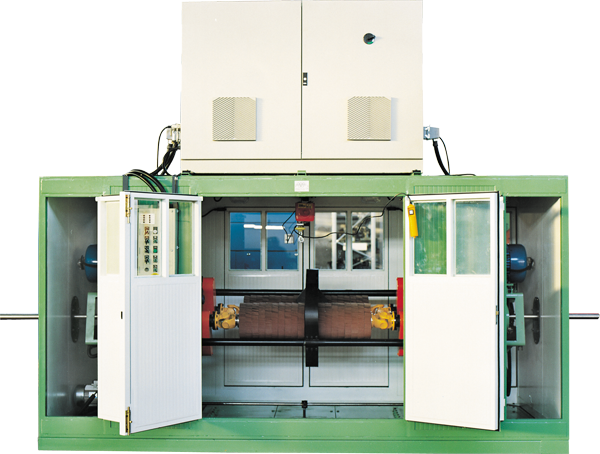 A PLC controls the machine operations and automatically determines, fixing some data regarding the product and the used blades, the carriage and blade speed and the blade position, making the cutting programming and process fast and easy. Double blade cut off for 16” tube mill. 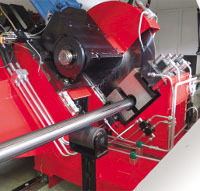 Olimpia 80 produces equipment for in-line brushing of round stainless steel tubes. 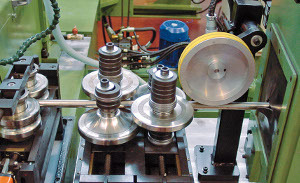 Different models are proposed, with use of two or three brushing heads in different lenghts, according to the type of product and to the line speed. Tube speed: max. 25 m/min. 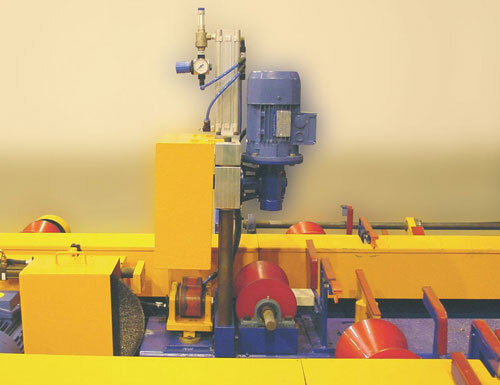 Planetary brushing machine, with 2 mandrels, for laser mills. Brushing is made using flap wheels. This new equipment, thanks to the addition of one brushing head, has 1/3 higher removal capacity than the traditional machines. It is mainly suitable for big tube size. 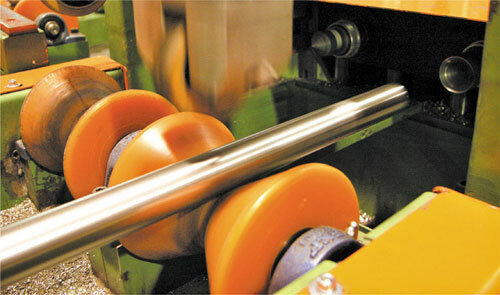 Planetary brushing machine for in line finish of stainless steel round tubes. 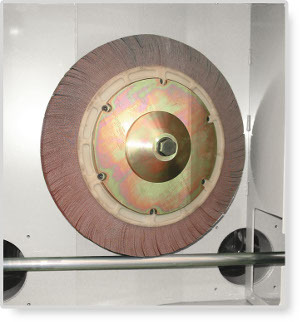 This equipment works by flap wheels and scotch brite wheels, with 300 mm diameter, mounted on two rotating shafts with a length of 1200 mm. 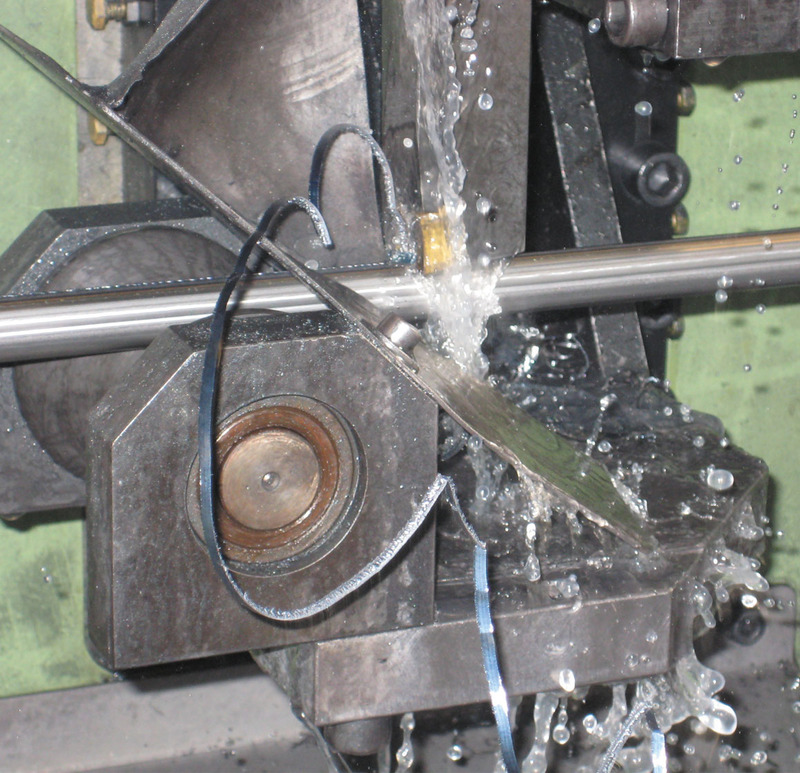 The brush arrangement on such length enables the machine to reach high speeds, making it the best choice for the finish of stainless steel tubes HF welded. 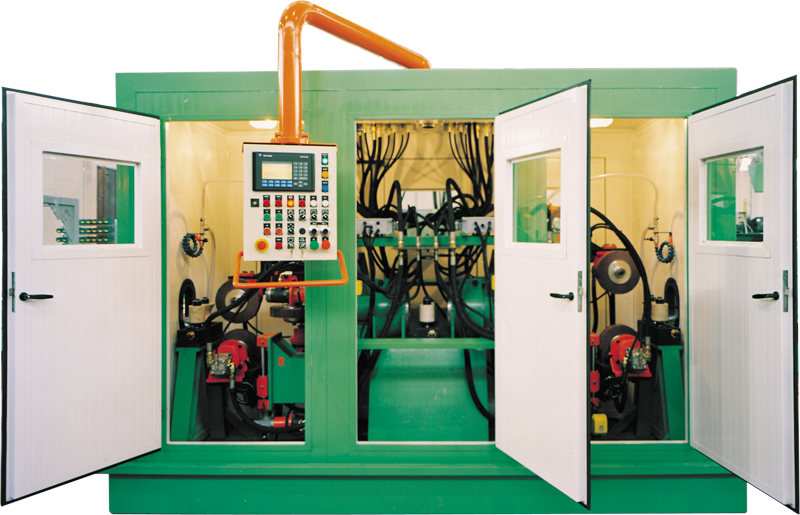 The machine is electrically driven with a total power of 75 Kw, while the working operations are set up by means of a control panel complete with an electronic automatic system which constantly adjusts the brush pressure on the tube surface. Production speed: max. 100 m/min. 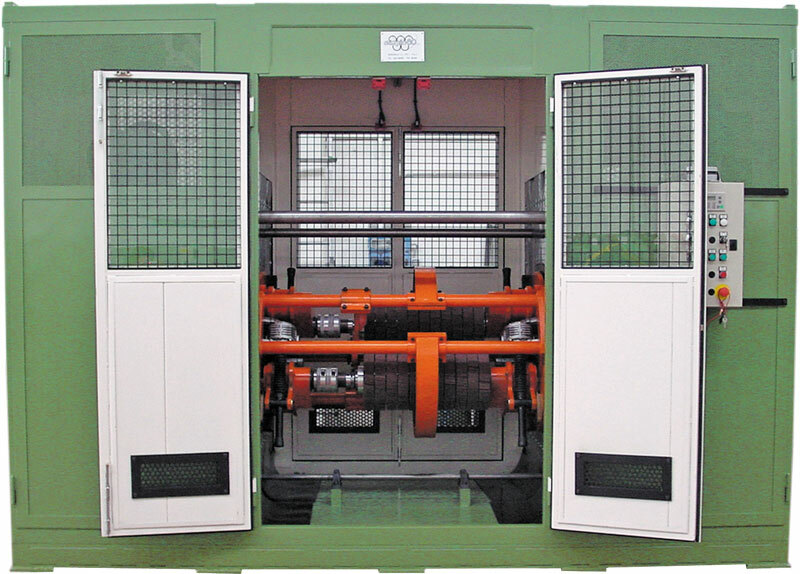 The electrical cabinet is positioned on the upper side of the machine to optimise the overall dimensions and allow the movement of the machine off line by means of sliding guides. 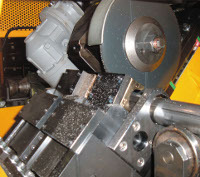 Rotating support for brush holder shafts with gearbox in oil bath and speed regulation. 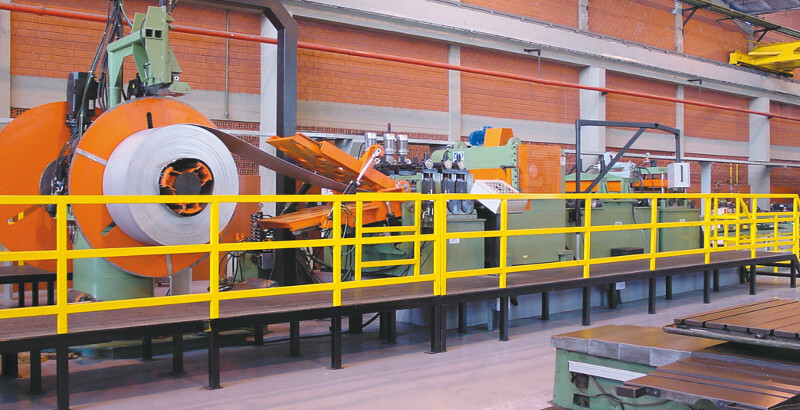 Olimpia 80 studies and produces equipment for the in-line brushing of square and rectangular stainless steel tubes. This equipment works with flap wheels and scotch brite wheels. It is suitable for the high speed producti- on provided by high frequency lines. 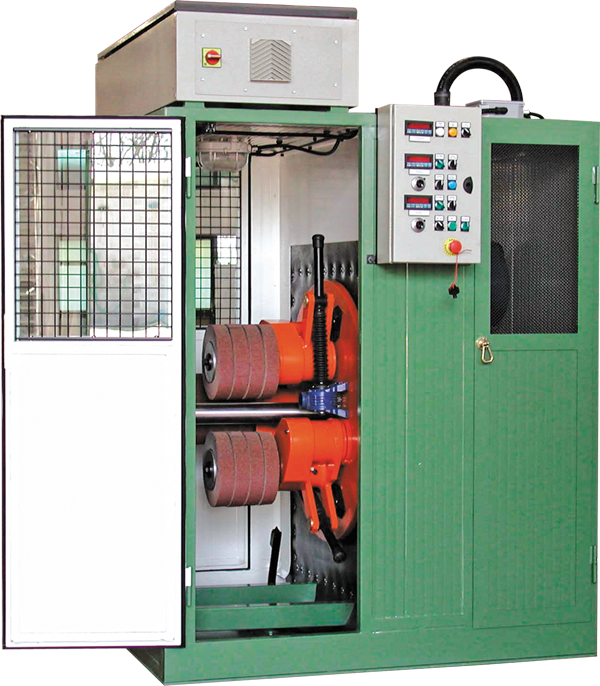 8 heads brushing machine for operation at 60 - 80 m/min. 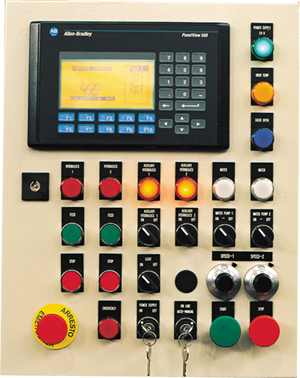 Control panel for the automatic adjustment of all controls. 16 head brushing machine for operation at 100 m/min. 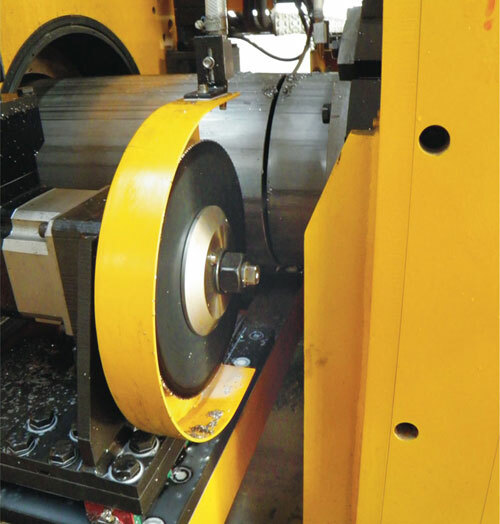 Machine for in-line tube end deburring by means of metal tools making the automatic inside and outside removal of burr. 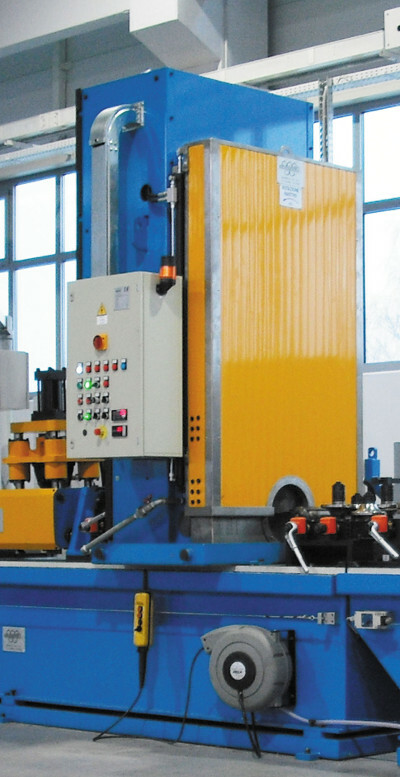 This equipment is used for tubes from 10 to 76 mm O.D., it is directly mounted on the unloading table of the mill and the tube movements are fully automatic. 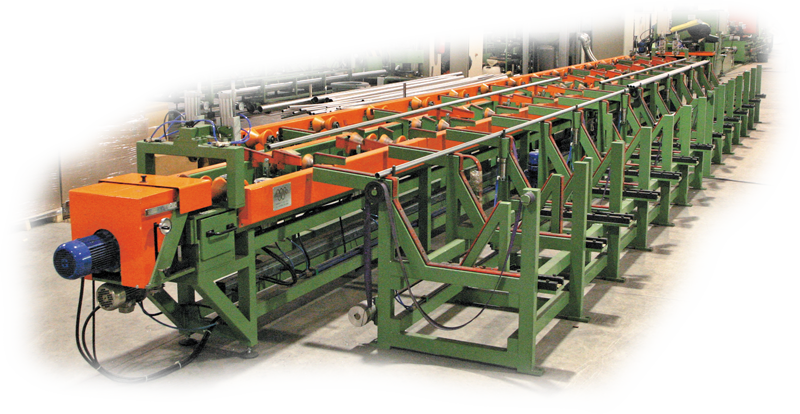 Tube unloading table with incorporated automatic deburring system. 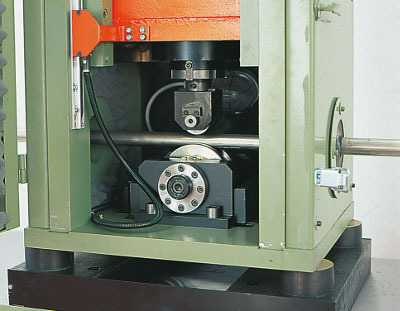 Unit for in-line tube ends deburring and chamfering. Machine for the tube ends finish by means of stainless steel brushes. Brush position is vertically and horizontally adjustable, while their speed is controlled by inverter. 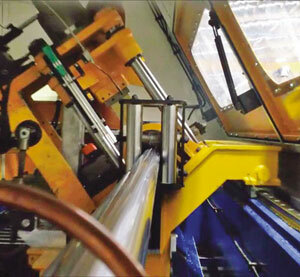 Tube movements on the roll ways and working speed are automatically controlled by PLC. Stainless steel brushes for deburring.